On the Affirmative, Messrs. Bruce Holcombe, Daniel, Camden;On the Negative, Messrs. Claiborne, Carter, Dabney.The Treasurer’s report was submitted and excuses heard.The report of the Committee appointed to canvass college for subscriptions for the Magazine submitted their final report and were dismissed. Motions and Resolutions being in order, Mr. Claiborne moved that the Washington Society be released from the debt owed by them to the Jefferson Society. It was moved and carried to postpone this motion for one week.Mr. Daniel’s amendment to Art. 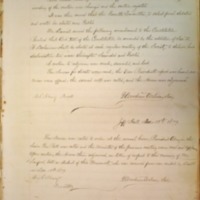 VIII of the Constitution, to the effect that, “A Declaimer be elected at each regular meeting of the Society, to deliver his declamation two weeks thereafter” came up, in order, and Mr. Daniel himself offered to amend to the effect that, “A Declaimer shall be chosen by the Secretary from the Roll, in alphabetical order, to deliver a monthly declamation before the Society just previous to the regular debate.” This amendment was seconded, and then withdrawn with the consent of the seconder. Mr. Felton moved to postpone indefinitely and his motion was seconded and lost. Mr. Bryan moved to postpone for one week. Seconded and lost. At Mr. Daniel’s request, the motion to postpone for one week was reconsidered and passed.Mr. Bruce moved to reconsider the motion of postponement passed upon Mr. Claiborne’s resolution. Seconded and carried. Mr. Felton then moved to postpone the consideration of Mr. Claiborne’s resolution indefinitely, but his motion rec’d no second. Mr. Claiborne’s motion was then passed. Mr. G. McD. Hampton moved that a committee of three be appointed to inform the Washington Society of the action taken. Seconded and carried. The President named Messrs. Hampton, Geigon, and Horner to constitute the committee.Mr. Bruce moved to proceed to the election of the Faculty Committee for the selection of prize debater and orator. Seconded and carried. Professors. Mallet, Cabell, and Venable were chosen.Mr. Gibson moved that the adjournment, when it takes place, be for two weeks. Seconded and carried.Mr. Hampton moved to return to the head of Motions and Resolutions. Seconded and Carried. He then moved that a committee of three be appointed to inform the electoral committee of the Faculty of their election. Seconded and carried. The President having ruled that the appointment of committees in all cases lay within his prerogative, an appeal was taken from his decision, but failed to receive the sanction of two-thirds of the House.Mr. Smith then moved to adjourn, but was ruled out of order, from which ruling an appeal was taken and lost.The classes for debate were read; the Vice-President’s report was submitted and excuses heard; the second roll was called; and the House adjourned. University of Virginia. Jefferson Society, “Jefferson Literary and Debating Society Minute Book,” 1879 December 13, WWP17250, Jefferson Literary and Debating Society Records, Woodrow Wilson Presidential Library & Museum, Staunton, Virginia.